← New VR Games for Play! We know that Georgia State University was “founded” in 1913. Or was it? 1911: W. M. Fambrough (Tech’s alumni association president and J. B. McCrary’s business manager) suggests to alumni and administrators the need for business courses: to give businessmen a college training, and engineering students a business training. Juniors, seniors, and alumni support the idea, and Tech President Matheson presents a plan to faculty. Fambrough and alumni conduct a funding drive to raise $25,000 (over $600,000 today) for the proposed course. 1912: February 1912—McCrary, Fambrough, Joel Hunter, and Samuel Inman start an evening lecture series which juniors and seniors are encouraged to attend (Spring 1912). At the end of spring term, faculty put commerce lectures on the senior’s regular schedule. Several prominent Atlantans become alumni “guarantors,” providing nearly four years of partial funding until Tech could assume the obligation (state funds had already been allocated, and Tech’s charter restrained its functions). 1912-13 academic year: (September to June) Tech approves a commerce program, and a full series of monthly business lectures is scheduled. This first course, offered in Winter 1912, centers around lectures on accounting, commercial law, buying, and selling. A faculty committee selects six Atlanta businessmen including certified public accountant (CPA) Joel Hunter and senior attorney Edgar Watkins to teach it. In addition to these six non-academics and a few part-time instructors (also in business or related fields), a few regular Tech faculty like Wayne Kell participate. Kell, who taught metallurgy and geology, also becomes one of the earliest Georgians to earn a CPA license. Attending lectures is now mandatory. This work leads directly to the creation of Tech’s School of Commerce in 1913. 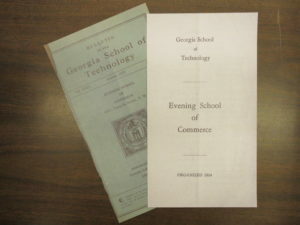 1913-1914: By September 1913, Tech’s new School of Commerce offers two programs. One, taught by the “commercial division,” is intended for businessmen and meets evenings between 6 and 8 p.m. Graduates receive a three-year Bachelor of Commercial Science (B.C.S.) degree and “irregular” students receive a certificate. The other, taught under the “engineering division,” provides regular engineering students with business training and meets during regular daytime hours. Kell becomes assistant professor of accounting and finance, and dean. 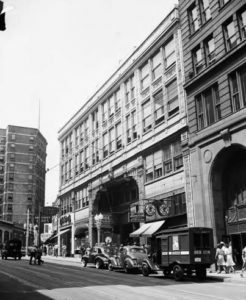 1914-15: As day and evening classes continue on campus in 1914, Tech and Dean Kell also rent quarters in the downtown central business district and open an evening school of commerce, making it easier for students employed in businesses and government to attend classes after work. Located initially in the Walton building, the Evening School of Commerce grows rapidly and moves repeatedly to more spacious locations downtown. 1915-16: Tech graduates its first Commerce class with B.C.S. degrees in summer 1916. All seven men have full-time jobs. 1916-1918: The on-campus program began diverging as early as Fall 1916, when Tech not only assumed funding responsibility but introduced a four-year Bachelor of Commercial Science (B.C.S.) degree, available to downtown students only by taking several courses on campus during the day. In addition, while night classes were offered in both locations in Fall 1916, only six courses were on Tech’s campus while ten were at the downtown Evening School—another clear indication of its rapid growth. And finally, the downtown school distinguished itself most sharply from all-male Tech when, in Fall 1917, it admitted women—at a time when co-education was not permitted. ¹ Merl Reed, “Educating the Urban New South: Atlanta and the Rise of Georgia State University, 1913-1969,” pp. 6-7, unpublished manuscript (G2009-58), Georgia State University Archives. Want to investigate further? Look for Reed’s book and digital copies of early undergraduate catalogs in the Library’s collections, and the Georgia State University History research guide. This entry was posted in Digital Collections, Education, For Faculty, For Graduate Students, For Students, History, Primary Resources, Resources, Special Collections & Archives and tagged Georgia State University, Georgia State University history, higher education, W. M. Fambrough, Wayne Kell. Bookmark the permalink.